Back in February we found this sweet dresser/cabinet at the salvation army for $30. I have been looking for one this size for so long and finally got lucky! With our fireplace being in the corner of the room (the focal point), I wanted something just big enough to hold the tv and still allow room for a stack of blankets between the tv and fireplace. I forgot to take before pictures, but the dresser was in need of some love. It was light brown with plenty of defects, and it also had a glossy veneer top and sides. We weren't sure if it would paint okay, but after sanding it and putting on two coats of primer, we only needed one coat of paint. I used a $3 sampler of Martha's Sultana green and we even had some leftover. The dresser originally had knobs on the drawers and doors, but it was missing one so I took the rest off and replaced just the door knobs with clear ones from here. I originally bought these from anthropologie, but they ended up being too large. 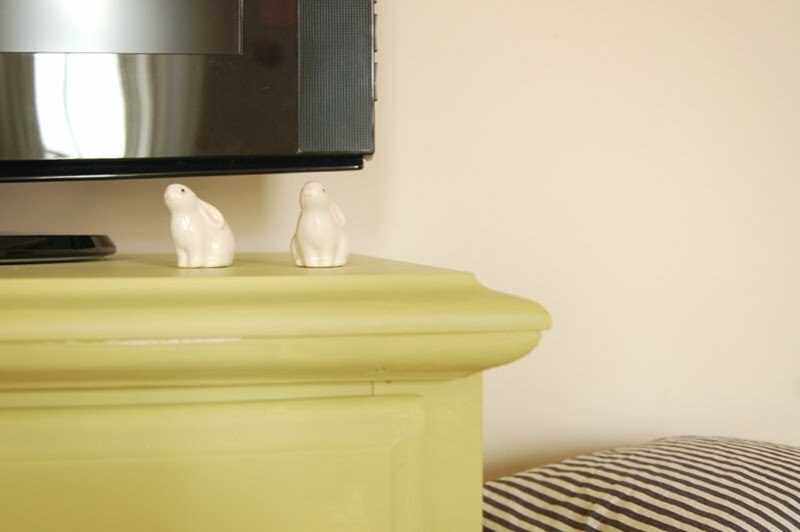 We filled in the holes on the drawers with wood putty before painting. I love having the concealed storage now for all of our "accessories". 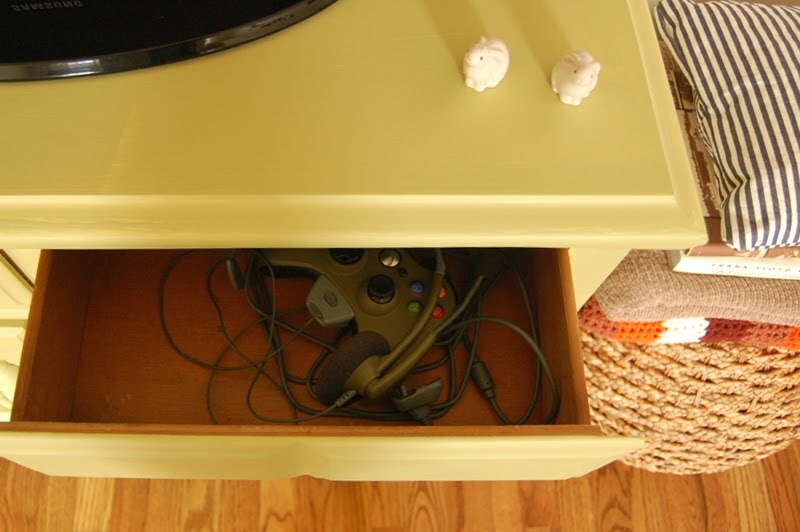 Q's xbox stuff stays nicely hidden and he has his own drawer dedicated to his controllers. I use mine for storing extra candles. Now I have the urge to line those drawers! Thanks Cassi! We just got one here a year or so ago, love that store - I'll check it out. Great find! I love that you painted it a bright happy color. I have a lot of "project" pieces I've been collecting in our basement storage and this has inspired me to get a move on and start painting them. Love it! I love a good thrift store find...especially when it is furniture! 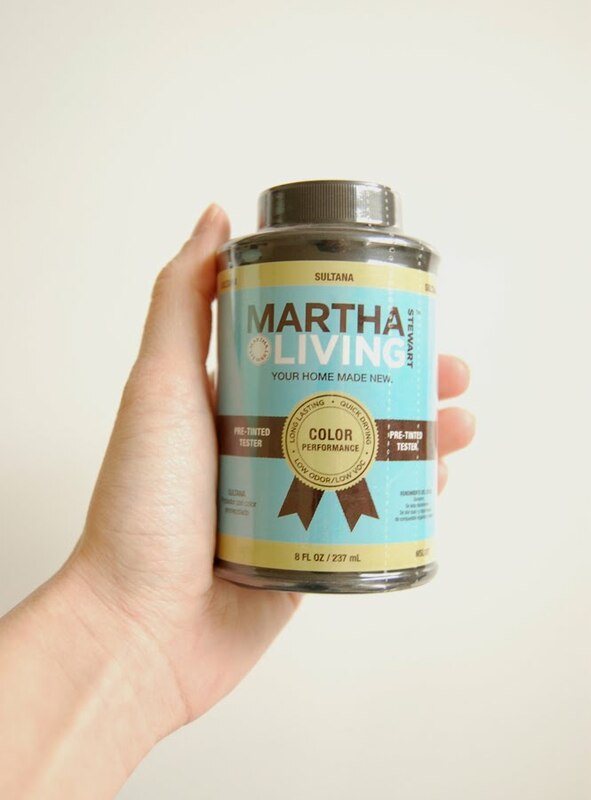 love the color + project!! 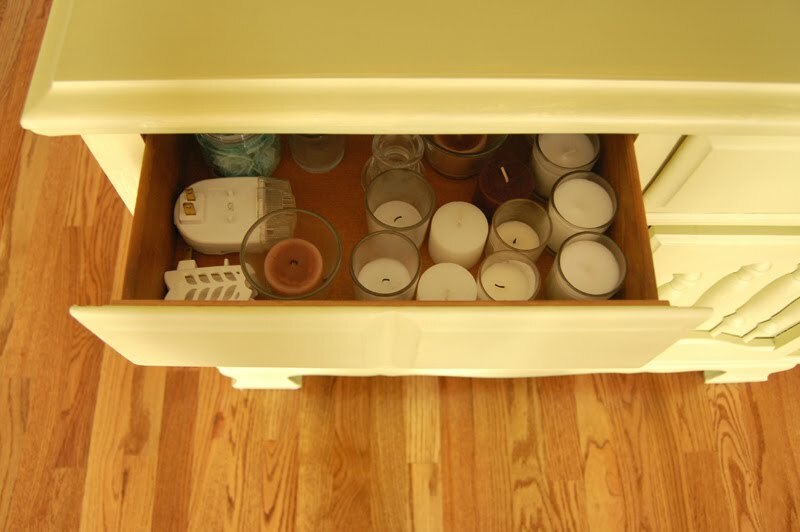 very beautiful + lining the drawers sounds like the perfect touch to complete it inside + out~ thank you for sharing! 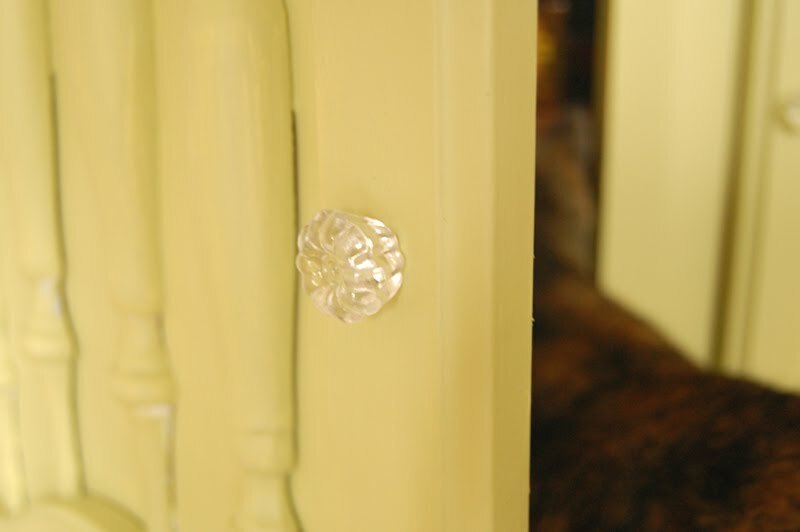 That is a fabulous paint colour and those clear knobs are divine! Well done. You've inspired me! We've got a bunch of things left to accomplish in our living room, and now I'm motivated to get them finished. oh, I love the color! nice job! wow this looks so so spectacular. love this color. sounds like the 2 coats of primer really did the trick! did you roll or brush it on? Oh your so lucky! I have been looking for a tv comode for ages and dont seem to find one...this is dulce! That colour is fantastic! I'm really loving Martha's paint line, I painted my guest room her 'Nimbus Cloud'. Cute!! Great job Alli! I love the concept! 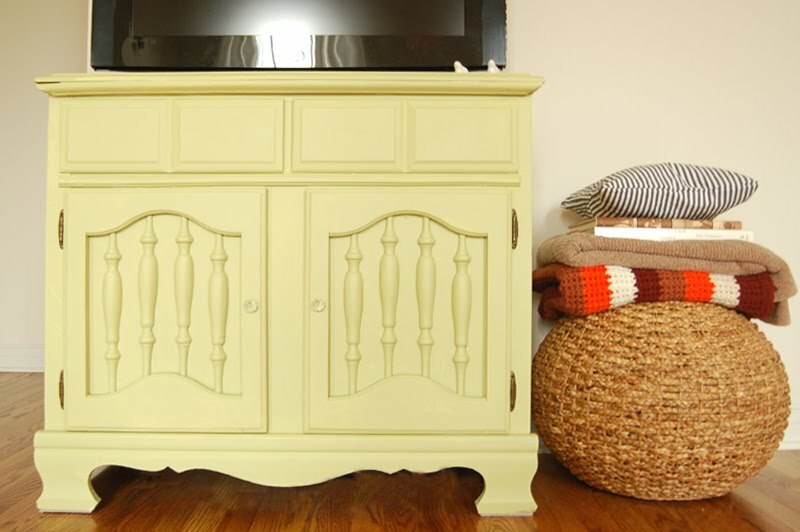 Love the green color and the clear knobs! Awesome job!